Digital-Projection stellt eine neue Generation der Single Chip DLP Laserprojektoren vor. Der M-Vison Laser 21000 WU kommt mit wartungsfreien 20.000 Lumen und Colorboost+Red Laser Technologie. Das ermöglicht besser als je zuvor die Darstellung von realistischen und gesättigten Farben bei einer bisher unvorstellbaren Lichtdichte. Zudem ist das optische System des Lasers bis zum Objektiv vollständig abgedichtet (IP60). So kann Staub der Bildqualität nichts anhaben und ein Einsatz im Außenbereich steht nichts im Weg. Englische Originalbeschreibung: The M-Vision Laser 21000 is the first of a new breed of Single Chip DLP Laser projectors from Digital Projection. This lamp-free, laser-phosphor projector utilises new Colorboost+Red Laser technology to bring you the most realistic and saturated colours at previously unimaginable luminance levels. Such power and accuracy, combined with all-new intelligent processing brings the overall performance ever closer to that of a 3-Chip DLP projector – at a much more affordable price. Boasting an unprecedented 20,000 lumens output and a 10,000:1 contrast ratio, the new M-Vision Laser 21000 brings budget-sensitive applications a large-screen imaging solution and near 3-Chip performance at a 1-Chip price point. The optical system, from the laser light source up to the lens is completely sealed and can be considered IP60 rated. This ensures that light output and colour performance will not be degraded due to the ingress of dust. Additionally, this projector is completely filterless as the system is liquid cooled and uses a radiator heat exchanger, minimising maintenance as no replacement or cleaning of filters is necessary and allows unrestricted airflow. Venues contending with ambient light, as well as applications needing a powerful yet budget-conscious large-format imagery solution without sacrificing on colour accuracy will directly benefit from the M-Vision 21000 class leading light output, contrast ratio and colourimetry. Perfectly suited to all applications where high brightness is required, no feature has been overlooked. DisplayPort accepts frame rates up to 60 Hz and HDMI 1.4b for Side by Side, Frame Packing & Top Bottom 3D formats. Motorised shift, zoom and focus across the whole lens range offers superb flexibility and ease of setup. 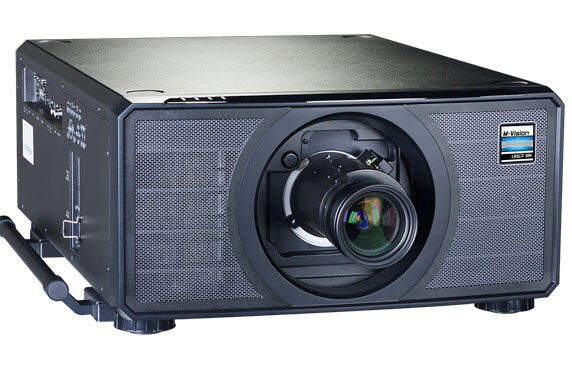 This projector is not a class leader – it is in a class of it’s own.